Once you are happy with your basic design and angles, you can start adding the detail, keeping in mind at all times how much of an illusion you need to include in order to get the effect of depth and distance. 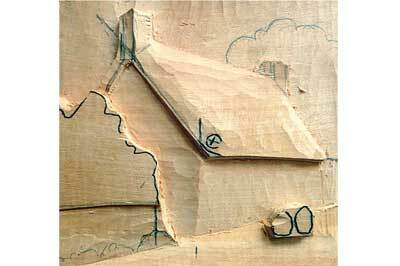 One problem that will inevitably rear its ugly head at this stage is that if there is any ground visible in your design, it will almost certainly be rising as it disappears towards the back of the carving. Also, anything that is vertical like trees, telegraph poles, posts and standing people will look as if they are falling over backwards because of the angle with the ground. One way to overcome this problem is to set back the bottom of all verticals between 6-13mm so they lean forward quite a way at the top. This will also have the effect of increasing the amount of foreground you have available for detail work. One final point about this type of carving is that, in order to maintain the crispness of the cuts and create clean shadows I don't advise the use of any kind of abrasive to get a good finish. If your tools are sharp and your technique careful, the finished piece should not need any sanding. I also advise the use of a finishing oil of some kind as opposed to sanding sealer or varnish as this doesn't need any rubbing down and can be waxed when dry. You can, of course, finish with a colour wash if you prefer; I find acrylics best for this approach. 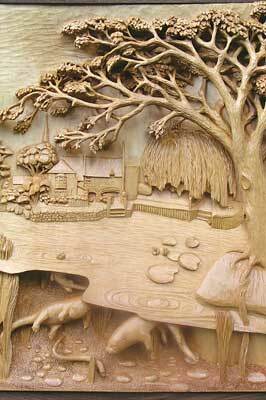 My closing observation is that many carvers think that relief carving is easy - don't believe them. It is easy to do it badly, but difficult to do it well. I did mention before that I would cover how to deal with common problems and, in fact, this is really very simple. As I have already mentioned you will need to give yourself escape routes and protect vulnerable areas, but no matter how careful you are, things can still go wrong. These little disasters can often end up with an improvement in the end product as long as you don't start sticking pieces back on. My philosophy is that if something breaks off I change the design if I possibly can, as it is very difficult to hide glue lines. 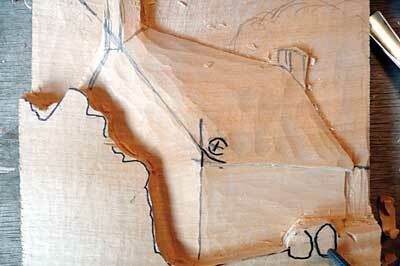 Remember a simple point: the solution to nearly every carving problem is to simply take off more wood. All you need to do is work out whereabouts you need to remove it! If legs or ears break off animals, you have little option but to glue or reject, but with humans - excluding nudes - broken arms, legs, feet, hands or heads can usually be transplanted, hiding the join in clothing. Even with nudes there may be the option of adding armbands or necklaces before adding new parts. 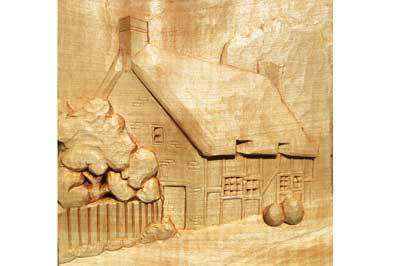 One consideration that will minimise the likelihood of disaster is to carve the most difficult parts first so, should anything go wrong, you haven't wasted a great deal of time on your piece. The final point is to bear in mind that every carver that there has ever been has made mistakes at some time or other - this is not a reflection on your ability, so don't cry in your beer. Take care when you work and if something goes wrong, have a good swear and put it right. The chances are you will be the only one who will ever know anyway!